I will be honest with you: Last christmas, I tried making some cookies... and they all sucked. They were horrible... some went directly to the garbage, but others, actually got better after a week of hanging around the house. Weird and gross, I know. After that, I thought I would never make a cookie. I like the cupcakes and desserts I make, so there was no need on baking cookies. That was until this recipe appeared. It is not easy to find reese's cups in Austria, so I faced a very important question... should I waste my reese's on these cookies that I might end up throwing. The answer is YES!!! They are delicious, and the best part is that they are impossible to ruin!!! While preparing them, I realized I did not have a mini muffin pan, so I used a big one instead, which ended up being better for the normal size reese's cups. u know what the cookies my mom made sucked too.....they were not cookies they were like stones....but i beautified them and shot a picture of them......!so that sucked .....!urs here look delicious although i hate chocolate....! I have never tried these before, they look really yum! Wow, you know REESE peanut butter chocolate cups is my favourite. I love eating them. 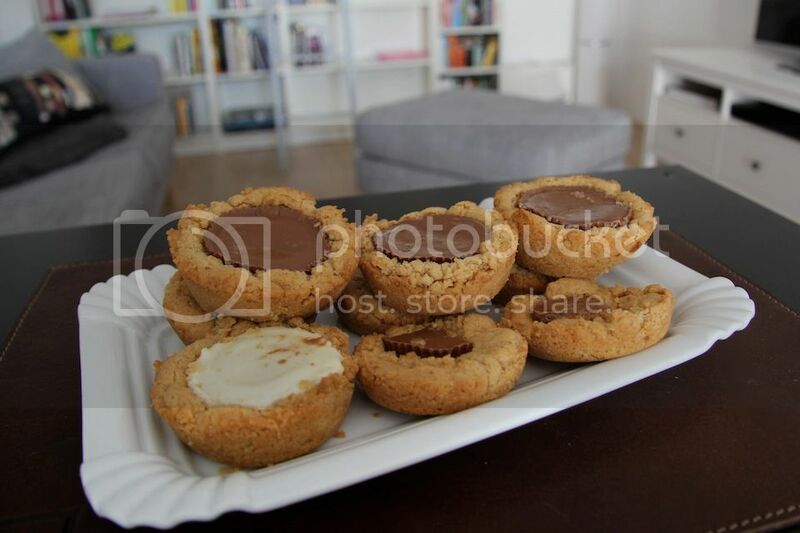 These look amazing, what a great twist on a peanut butter cup! Now I also follow you on facebook. They look just yummy. Can I have some?? look delicious frm the picture u took. Hi, I'm Emily. Hope you can visit my blog back! totally in love with your recipe and of course your blog! I'm your new follower and would like to invite you to join me as well if it pleases you! Wish you a great Sunday and a very happy World Baking Day! wow!! These look delicious!! I love baking! Ileanna! This looks so so very yummy! What are the odds that while searching through GIG I find your blog with my FAVORITE cookie? I'm STOKED!